There exists in the Catholic tradition many stories of heroism and piety that have stood the test of time. To be sure, there are many of such traditions that have been dropped or deemed theologically problematic, but there are some of which though not supported in Scripture, have been preserved and handed on due principally to the spirit of what they represent. One of these is the action of Veronica, one of the outstanding people that Jesus is said to have encountered on the Via Dolorosa, or the Way of Sorrows, the route which he took to reach Calvary, the place of his crucifixion. Catholics always remember Veronica in the season of Lent, particularly when praying the devotion called the Stations of the Cross. In almost every Catholic church or chapel, one will notice that along the walls, there are often images of Jesus’ walk from his sentence to his being laid in the tomb. 14 in total, these have been artistically interpreted and can be found in a multitude of mediums, from copper tooling and oil paintings to stained glass. One of them, usually the 6th station is one that depicts an encounter of Jesus and a woman named Veronica, and she is seen wiping the face of Jesus. Church tradition holds that Veronica was moved with pity when she saw Jesus carrying his cross to Calvary, resulting in her providing her veil to him just so that he could wipe the grime, blood and perspiration from his face. Because this act of kindness was so genuine and unexpected, it was returned with a gift that was just as unexpected. 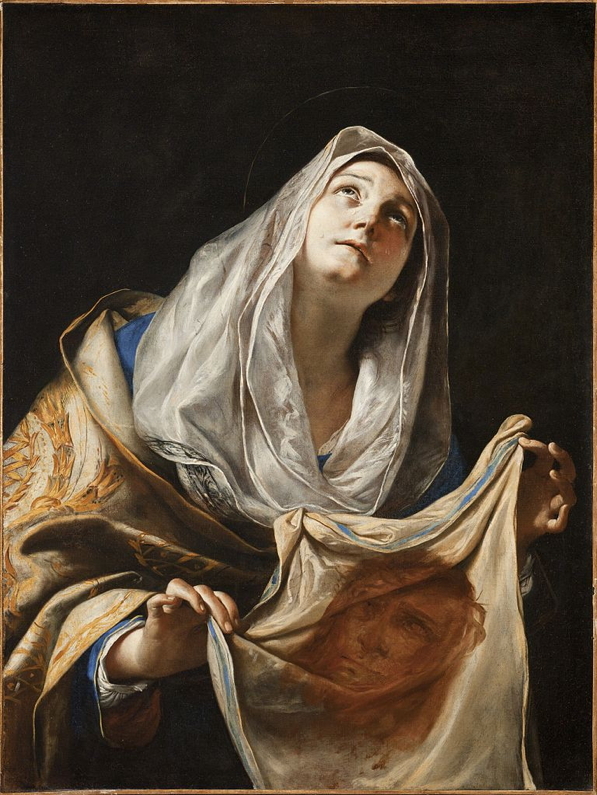 After having wiped his face, the veil was returned to Veronica, but with the image of the face of Jesus imprinted on it. Apparently, the etymology of the name Veronica can be traced to this story, as it is made up of two Latin words - true image, where vero is true, and icon is image. Whether or not this is the actual etymology of the name Veronica is up for debate, but what can be of great benefit to us is to give some serious thought about this act of kindness offered by this charitable woman. All disciples of Christ are called to be images of his. Any call to action in and through our acts of love and kindness, generosity and charity are means through which our likeness to Christ becomes strong and real. While these are things that we may implicitly be aware of, they are also a great challenge to practice, especially towards those who we find so hard to love without bias. And this is where we will benefit from realizing that it was difficult for Veronica to have done what she did. She made the effort to step out of the crowd and to make a difference in Jesus’ life. While it is always easy (considerably, at least) to serve and love those whom the masses of humanity approve and accept, it is always going to be difficult to love those who are not mainstream, marginalized or even sidelined. It’s probably too crass to admit it, but we fear the stares of others when we love the downtrodden and social misfits. We fear their stray comments that can be hurtful and even untrue. When a woman like Veronica stepped out to meet Jesus on his way to his ignominious death, she would have put aside such toxic thoughts and paralyzing fears. She had put the need of the other (Jesus) above those of her own, abandoning her need of being safe, accepted and anonymous. We are at our Christian best whenever we too cast aside our own personal fears and needs and love others for their sake. Veronica received as a reward something so unexpected for a deed done with hardly any self-regard. When we love with altruism and selflessness, we can be assured of obtaining something similar. While we may not receive an image of Christ on a veil, we can be sure that we have given the image of Christ through our deeds. Christ becomes incarnated in the ways beyond our imaginations. Our lives become not just the veil but also the canvas on which God paints his love in ways beyond our ken.